In part one of this five part blog I mentioned that for me travel allows us to find our magic. You can read part one, Break your routine and free your spirit, here. For those of you who want to perform at your highest level and live your best life it can break you out of your comfortable routine ways of being, doing and thinking – the routines that keep you stuck. When you approach it with enthusiasm and an open heart, a clear intention to receive what you most need for your life and a willingness to let go of any expectations, you will reach a new level of joy and guidance towards your highest potential. And where you choose to go matters a lot. Some places can significantly shift your vibration and heighten your awareness to the opportunities that life wants to give you. Using nature to increase your energy will really pay dividends. You’ll feel much more in flow, connected to all that is; detached and patient as the cogs of the universe turn in your favour. Places of natural beauty, especially mountains, ancient forests and those places that have been used as sacred sites of worship in past millennia, all have high vibrations that affect you immediately; even if you’re not conscious of it happening. Your mood lifts, you breathe deeper, you relax, you feel exhilarated, energised and more positive because you tend to drop out of your head and into your heart – which is of course where all the good stuff happens and your intuition can guide you more easily! 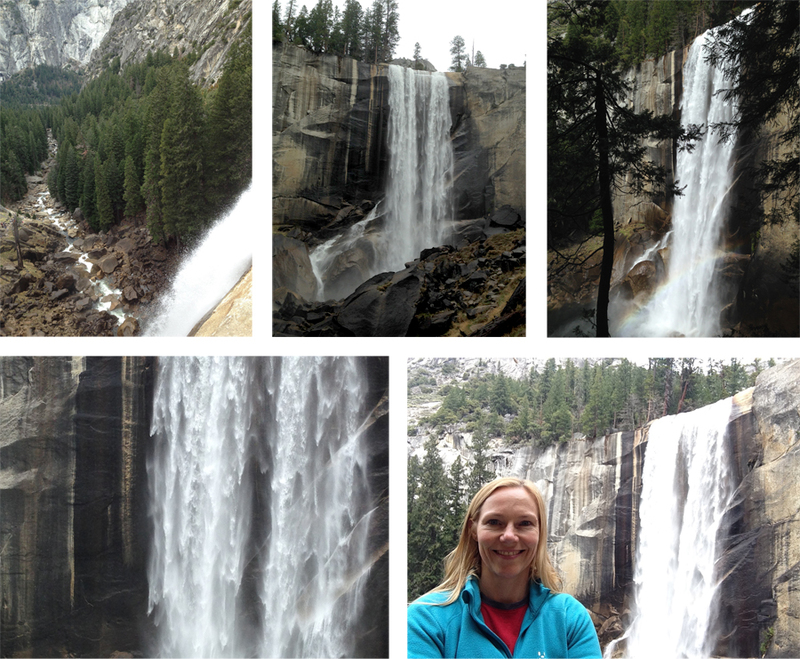 So although I went out to California with the more obvious purpose of attending a training seminar, it was really just the excuse I needed to be able to spend some time at Yosemite National Park. Something that had been on my wish list for years. While in Yosemite I had plans to do some hiking. Having already taken in as many of the jaw-dropping sights as possible from the valley floor on day one, the following day I wanted to hike the trails in the mountains for more spectacular views, and was recommended a visit to ‘Vernal Falls’. This was a relatively short, but very steep climb – 2000 feet in 0.6 of a mile to the top of this magnificent waterfall, half of which was a staircase of 600 deep and uneven steps. It was a stretch physically, especially the last 100 steps where my legs were burning and feeling like jelly, and there were some pretty scary sheer drops to the side of the path with no barriers, but my intention was strong and the way was straightforward, so there was no way I wasn’t going to get to the top! Perseverance and finding my own pace so I didn’t over exert myself got me my reward of stunning views of the most beautiful waterfall I have ever seen, a huge sense of achievement at having reached my goal, and the uplifting feeling, deep joy and reverence from being high up in the mountains surrounded by such awe-inspiring beauty. Takeaway: To achieve your true desires you need to accept the effort that will be needed – it’s not just a case of wishing and visualising for your desires to come true. You have to take committed, consistent action; keep going one step after the other at a pace that sustains forward momentum, with regular breaks when you need to. But stay on the path and keep going, and you WILL reach your goal. Having a very clear target and committing to a path, or strategy to get there will focus your energy, making you more effective and efficient. And often the going gets toughest when you’re just a few steps from a breakthrough or reaching your goal. Question: In what areas of your life would it serve you to have clearer goals and an action plan for success, especially for when the going gets tough? How could you be using nature to increase your energy? What places of natural beauty have you always wanted to go to in the world, and what steps could you put in place for getting yourself there? While you’re doing the steps towards your BIG goals, what places closer to home could you get to on a regular basis to maximise your energy? I’d love to hear your feedback so feel free to comment or hit reply to this email. As a nature and wildlife filmmaker, nature plays a big role in my life. I find that nature can inspire and give you energy as well as claiming your soul and providing a perfect setting for reflectance. In the hustle and bustle of every day life, sometimes it’s difficult to be able to sort your priorities. Nature gives the the opportunity to prioritize because I’m connected to something much deeper than cell phones and Facebook. It also has a way to soothe my soul when times get difficult. Everyone needs to get outdoors even if you love in a big city. Amen to that Kevin! Nature is pure source energy available to us if we take the time to appreciate it and let it fill us up. Ah! You are SO right. Nature is the only thing that never takes away. It gives & gives & gives. Thanks for reminding me how important it is to unplug & commune with nature. Thank you Jeannie, that’s a lovely thing to say! I agree, it’s amazing we’re around in a time when there’s so much free information to help us grow! The waterfall looks amazing. Really beautiful. I love being near water and just watching it – I find it really nourishing. I’ve never really thought about it as being a physical thing, that the nature and water affects me physically or vibrationally. I’ve acknowledged it as being nourishing to my soul, and find myself pulled to nature when I need a spiritual/mental boost – now I need to make it a more regular habit, and use it’s energy when I have big decisions and goals to work on. It’s great to watch waterfalls and imagine that the energy of the water that’s cascading down is pouring through your energy field, clearing any blockages or negativity and returning to the earth to be transformed. You can bring to mind a particular issue that needs releasing or just use the experience to give yourself an energetic flush! Of course you don’t need to be at a physical waterfall to get the benefit. You can just use your imagination, but when you are somewhere in nature you definitely get additional benefits, and the sound and sight are so mesmerising that it pulls you into the moment and out of your thinking mind so much more easily.